Did you know that, despite what MapQuest says, the road that runs along the northern edge of the Pennsylvania State Memorial is NOT Pleasanton Avenue? And did you know that the NPS doesn’t officially recognize a place called Pitzer’s Woods? 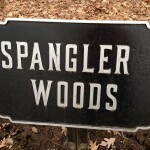 Or Spangler’s Woods? Or Barlow’s Knoll?? The explanation for all of these things can be found on the National Park Service tablets around the Park. 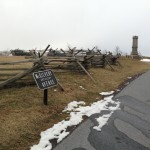 The Gettysburg National Military Park has more than 230 bronze tablets which identify the brigades, divisions, corps, U.S. regular units, and hospitals from the two armies. It also has more than 30 cast iron itinerary tablets and those marking the positions of artillery units. All of these tablets (as well as more traditional monuments, of course), along with their inscriptions, photos, and locations, are in our popular smartphone app, Pocket Gettysburg. But there are 80 other cast iron tablets around the Park1 which get less attention and aren’t typically considered “monuments.” The NPS is nonetheless responsible for their maintenance and preservation. With one exception,2 these additional tablets were installed by the NPS’ predecessor, the U.S. War Department, in the years 1896-1920. (Yes, tablets were cast-iron a hundred years before iPads were cool.) Most of them fall into three categories which the NPS calls “Site ID Tablets,” “Avenue Tablets,” and “Information Tablets.” You’ll find them all listed below. the Sixth Ohio Cavalry monument at the same intersection. The avenue that doesn't exist? Something has been deleted here. OK, but you’ve heard of Pitzer’s Woods, right? Well, take a look at the Park’s tablet there. 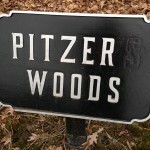 It says “Pitzer Woods”; it’s not possessive. In case you think that’s a mistake, the List of Classified Structures calls it Pitzer Woods too, not Pitzer’s. In fact, look even closer at the tablet and you’ll see that, while it was originally cast to say “Pitzer’s Woods,” the Park Service has carefully painted over the apostrophe and “S” to correct the mistake. Likewise for Spangler Woods. Apparently, somebody else cares about this minutia too. Similarly, it is Barlow Knoll, not Barlow’s. Yikes! That doesn’t exactly roll off the tongue. But don’t take my word for it. Go look at the tablet. Or the database. Don’t even get me started on Calvary! That’s yet another knoll – but outside Jerusalem. The horse soldiers are c-a-v-a-l-r-y, notwithstanding the embarrassing spelling on this Gettysburg-related monument in Lemoyne, PA, among others. Now I admit that some of this topic is just silliness that some will respond to by saying, “Who cares? !” But I find it entertaining to discovery these little stories and details about the Park that are missed by most visitors. Isn’t that why we keep researching, talking, and learning about Gettysburg? 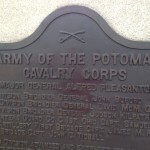 Some day I’ll make a blog post about the many other misspellings that I’ve found on the Park monuments, including the names of at least three Medal of Honor recipients. Oh, and if you’re a stickler for pronunciation, check out this cool video from Garry Adelman for the Civil War Trust. OK, so following are the lists that I promised. 2 The American Legion tablet in the Soldiers’ National Cemetery was installed in 1955. 3 The link is correct but the site is often down. So if it doesn’t work, then wait a bit and try again.